Exclusive network of dentists FOCUSED ON YOU. Our worldwide dental experts offer teeth whitening procedures — that focus on innovation and breakthrough processes. With professional teeth whitening products and services, you can brighten your smile quickly, safely and effectively. In-office, professional teeth whitening systems utilize safe, effective and gentle light-activated tooth whitening gels to whiten teeth by 8 to 10 shades in under an hour. Home whitening treatments include a low-strength peroxide gel that is applied to mouth-guards or gel strips. Products designed for use at home will improve the color of teeth that are only slightly discolored. Teeth that have significantly yellowed cannot be lightened using home-bleaching kits as the peroxide is too diluted. It is important to note that some home teeth whitening kits and teeth whitening gels can cause damage to teeth if used extensively and can weaken tooth enamel. Dentists do not always recommend the use of pharmacy purchased whitening treatments. Patients who wish to whiten teeth at home are advised to consult a dentist and use a professional tooth whitening kit designed to protect tooth enamel as well as whiten teeth. Professional tooth bleaching kits supplied by dentists use a custom made mouth-guard and the correct strength of concentrated peroxide to suit individual patients. The amount of lightening required and the strength of the tooth enamel is taken into consideration and a bleaching solution that will not harm the tooth enamel is given. Laser tooth whitening is the most advanced method of tooth whitening available. Cosmetic dentists apply a high concentration peroxide to teeth and shine laser onto the bleach to accelerate the bleaching process. 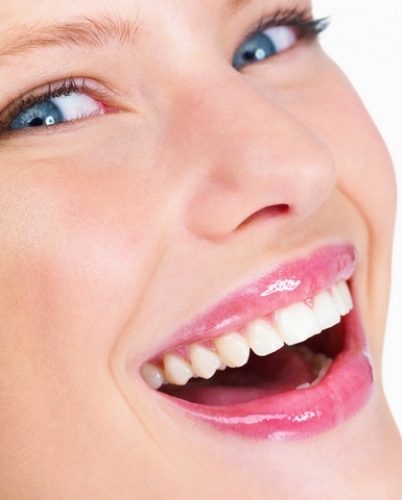 Laser whitening is a fast and effective way to lighten teeth and remove ingrained stains. To measure whiteness, dentists use a shading chart. Your teeth will be matched to the chart prior to treatment and you and the dentist will decide on the level of whiteness that is achievable using the chosen whitening method. To retain the results of tooth whitening after treatment, patients are advised to avoid food and drink that can stain or discolor teeth, red wine and coffee in particular, and to maintain thorough dental hygiene, brushing and flossing teeth regularly. If patients are unhappy with the results of teeth whitening, or want a longer lasting alternative, dental veneers and Lumineers offer permanent and removable options to whiten teeth.